Customs officials have recovered 61 bales of cocaine in west Cork in the largest seizure of the drug in the history of the State. 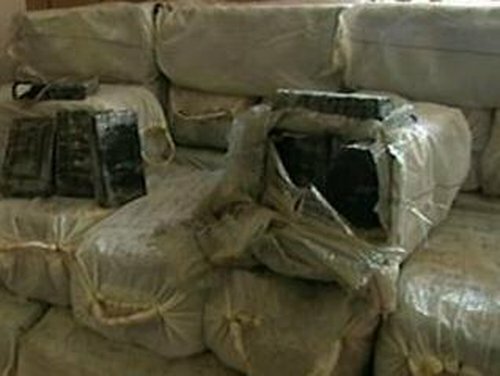 Gardaí are still searching for two men who they believe were part of an English drug-trafficking gang who tried to smuggle almost €107m worth of cocaine into the country. Gardaí have found a second inflatable boat, which they believe the gang was using. Customs officials and navy divers have now suspended the search around Dunlough Bay due to deteriorating weather conditions. The naval vessel, LE Orla, remains at the scene. Three vehicles found near Dunlough Bay are also being examined. Taoiseach Bertie Ahern has described the seizure as a matter of serious concern. Mr Ahern insisted it was too early to draw conclusions about the source of the drugs or their intended destination, but admitted there was evidence in recent years of increased cocaine smuggling using leisure craft landing in remote locations. The Taoiseach said that while most of this was off the coasts of Spain and Portugal, remote inlets in Ireland were also being used. He also told the Dáil that it was weather conditions rather than intelligence which saw the seizure of cocaine being made. 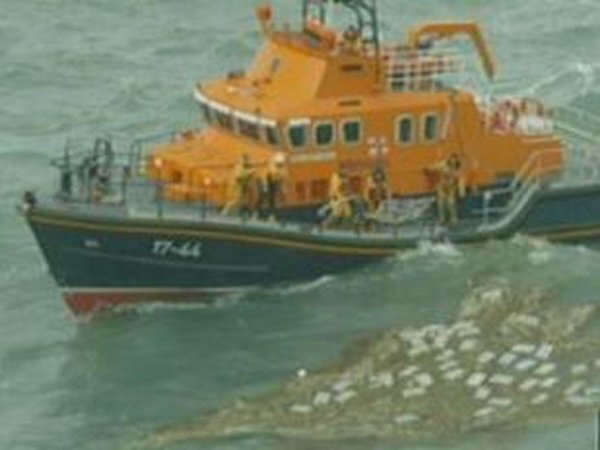 Earlier today another bale of cocaine, worth €1.75m, was recovered from the sea off the west Cork coast. It is thought most of the cocaine was destined for the English market. Both men still being sought are in their 40s. A 22-year-old man is being questioned in connection with the seizure and gardaí are waiting to speak to a man in his 40s who is being treated in Bantry General Hospital. Gardaí have extended road blocks and it is now impossible to gain any access to Dunlough Bay. Yesterday, more than 1.5 tonnes of cocaine were removed from the waters off west Cork in what was the largest seizure of cocaine in the history of the State. Customs officers believe more of the drug could still be found. However, navy divers decided not to dive this afternoon in search of packages due to poor weather conditions. It is thought that all remaining packages are floating on the surface of the water and only surface searches were conducted this afternoon. Speaking on RTÉ Radio's Morning Ireland, Seamus Lynch of the Revenue Customs Services said the search is expected to last for several days. He said an inflatable boat used by the men was lifted from the water late last night and was brought ashore at around 1am this morning. Early indications suggested there were no drugs onboard, but a detailed search of the vessel has still to be carried out. A second boat was recovered this morning. Mr Lynch also said that customs were investigating the possibility that an inflated vessel had met a larger yacht, converted fishing boat, or ship to bring the cocaine into shallow waters.